I first had the idea for Lost Sheep in Yellow Jerseys at the beginning of June 2013. 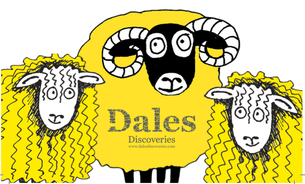 We launched it a few weeks' later on 5th July, with huge support from Yorkshire Dales Tourism Businesses. My original idea was to encourage 30 – 50 businesses to create their own Lost Sheep. Each sheep had to wear a Yellow Jersey so it was highly visible, and looked cheerful in case of rain (remembering last summer). I hoped to get a few donated prizes. The generosity of Dales businesses was astounding - within a couple of weeks we had almost 200 prizes (with a total value of over £10,000!) and over 400 Lost Sheep in Yellow Jerseys. The idea was very simple: visitors had to spot at least three lost sheep and report their sightings on the website. Correct entries were put into a prize draw. The challenge ran from 5th July – 5th September. They could enter as often as they wished and we had a star prize for the person who spotted the most lost sheep. The winner actually spotted over 160! We decided not to charge a participation fee to anyone who wanted to be part of the Lost Sheep promotion but did say it was on condition that they offered to help with promotional activities such as links on the website, displaying posters, distributing our promotional postcards, and on social media. This proved to be an enormous success – it meant that although I put more effort and time into the activity and worked very long hours to get it off the ground, the actual costs were limited. We had several schools who asked to participate, a police station (their sheep wore a striped uniform and carried a swag bag), and some individuals including farmers. One farmer put a very prominent sheep made out of real fleeces on his wall just outside West Witton. This became a much photographed “beauty spot” and he set up a twitter account for the sheep… That particular sheep is due to make a guest appearance at Masham Sheep Fair!. I thought that if we got at least 500 entries, it would mean we’d been successful. I thought that many people would enjoy spotting the sheep and maybe photograph them but not bother to enter the competition, which was fine. Participants with visitor-facing businesses have told me this was true and some said they’d been told of people coming specially to photograph some of the best sheep. We were fortunate that the participating businesses were very generous with their time and made a significant contribution to the marketing of this project, adding information to their website, using social media to spread the word, distributing postcards etc. The Tourist Information Centres were very helpful. Some one wrote to me to tell me she wanted to nominate Lost Sheep for a Chartered Institute of Marketing award. Another Chartered Institute of Marketing member is now using the Lost Sheep in Yellow Jerseys as a case study for presentations to marketing students. It is to be featured in an international business magazine as an example of low cost but effective innovation! Some families (e.g. from Leeds) made repeat visits each weekend to find more sheep. More than one person described it as addictive! BIG thanks to all the Yorkshire Dales Tourism Businesses who participated with such generosity of spirit! We achieved all this with a tiny marketing budget (around £500) and lots of passion and enthusiasm.